Merge Multiple NSF files including all emails, contacts, tasks etc. Combine multiple lotus notes archives with current NSF files. Remove duplicate or redundant data items during merging process. Support an option for excluding deleted items folder. Allow user to set custom display name for merged NSF file. Preview live status of Merging & Joining two or more NSF files. Also Allow Merging of NSF files under offline Lotus Domino Server. No compatibility issue with any version of Lotus Notes. 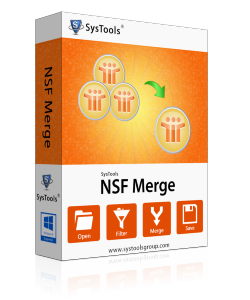 Merge 2 NSF files or Multiple NSF files using this incredible software. The tool allow to combine lotus notes archive files into one single consolidated NSF file so that you can have access to the data of multiple NSF files from a single NSF. Software support joining of multiple NSF files using JOIN operation. Using this option user can have access to NSF files separately as these files are joined in a particular single Folder. For eg, File1.nsf & File2.nsf are two separately joined NSFs. NSF Merger Software effectively able to remove all duplicate data items and kept only one copy of redundant data from multiple NSF files. Thus Final NSF file doesn't have a single bit of duplicate data. Merge two (or more) lotus notes archive files without including deleted items folder. Need for this exclusion arise when you discover that merging of multiple NSF files will lead to very large unmanageable NSF file. Lotus notes merge nsf files to single NSF with the availability of user defined or custom name to the resulting NSF as per the ease of the user so that he/she can well manage data accordingly. Software will show up live merge & join status of merging or joining of multiple NSF files. The Information displayed regarding the hierarchy after joining plus merged fodders of NSF files with clear specification of removed duplicate count. NSF merge software merge all items of lotus notes NSF files including Email, task, calendar & journals automatically. In case of merging Lotus notes contacts there is a need occurs to separately browse Names.nsf file. NSF merger tool has no compabitability issue with any version of lotus notes. It successfully runs on lotus notes 9.0, 8.0, 8.5 & all below versions too. Demo version of NSF Merge software has following limitation. Join NSF Limit: Join only first 2 folders of each NSF file. Lotus Notes – Lotus Notes 9.0, 8.0, 8.5, 7, 6 & below Versions are Supported by the Software. Is it possible to Run the software on latest version of windows OS? Yes, Software has no compatibility issue with any version of windows OS and you can run this tool on latest windows 10 also. What is the maximum limit of NSF files that the software can merge at one go? Yes, you can merge N number of NSF files at one go but it takes time as per the size of NSF files. Is this tool can merge password protected NSF file? No, This tool cant merge password protected NSF file. Can I provide custom display name to merged NSF file? Yes, software allow you to decide the name whatever you want for your merged NSF file using custom display name otption. NSF Merge is an incredible tool, I used its Freeware demo version and I am completely satisfied with the software capabilities. Moving ahead to buy its complete licensed version without any second thought. Thanks to the complete Revove team. Successfully merged large number of bulky NSF files in just few minutes with help of Revove NSF merge tool. It's a great tool I ever used in my life that provide instant and reliable results. I appreciate the effort of development team of Revove.